On 19 January 2015, I attended the meeting on Big Data at the RSS. The speakers included: Kenneth Cukier (Data Editor at The Economist); Haishan Fu (Director of Development Data Group at the World Bank); Alex ‘Sandy’ Pentland (Professor at MIT and Academic Director of Data-Pop Alliance); Nuria Oliver (Scientific Director at Telefonica); John Pullinger (UK National Statistician), with Denise Lievesley (Dean of Faculty, King’s College) as Chair. It is impossible to summarise the contributions or the excellent discussion, but here are some comments (recorded approximately) that give a flavour of the discussion. Haishan Fu: “The WB’s aim is to support national data producers and to incentivise the private sector … with a particular aim to help poorer countries ‘leap-frog’ to catch up”. At the end of the session, the Chair, Denise Lievesley, asked for reactions from the audience, in terms of what we would take away from the meeting. My reaction was that the discussion had made me realise, even more strongly, that statisticians (along with others) over the years have refined a number of crucial ideas, based on a sense of methodological quality (or validity). These relate to several issues. First, causality is to be distinguished from correlation. This can of course be accomplished by RCT designs, as well as by carefully-controlled and replicated non-experimental studies. Second, it is important to appreciate how the available indicators have been constructed and understood by the human beings (or processes) producing them. Hence John Pullinger’s timely offer of a course in questionnaire design to one of the “Big Data-enthusiasts” on the panel. Third, the data analyst also needs knowledge of how the sample before us has been selected, and attenuated by various forms of non-response. These three methodological concerns are not always fully acknowledged by enthusiasts for big data. An era when “Big Data” is being extensively hyped will produce additional challenges for statisticians re. data management and data analysis. These are already being addressed by inter-disciplinary teams many in universities and organisations. But there is no reason for statisticians to be reticent about the contributions they can make to these clearly important debates. This issue of Radical Statistics begins with three pieces which provide an overview of the value of the UK census and the damage that its potential cancellation will wreak. These articles highlight the disquiet that academics, policy makers and the public should feel about government plans for 2021 and beyond. In the first piece Danny Dorling highlights some of the surprises that have emerged from the 2011 census and suggests that only a government that does not care about its citizens would favour a plan which effectively makes it impossible to find out about them in the future (about where people live, about their needs, about their ages… etc). In the second piece Paul Norman makes the argument for the census and for small area data in particular. He ends with an appeal to everyone who has used (or is intending on using) census data to contribute their experience to the ‘business case’ for retention. The third piece, by Emma Stevens, is based on research conducted for an undergraduate dissertation. Emma surveyed human geographers about their use of the census and about how the proposed changes will affect their work. This article shows that the arguments made by Danny Dorling and Paul Norman are echoed by human geographers from across the UK. In the next section are three very diverse articles. The first, by Lucy Borland, provides shocking data on how changes in the regulation of lead in water in the UK (whereby 99th centile data is treated as a ‘maximum’) may mean that dangerous contamination is going unnoticed. Using equivalent data from Northern Ireland Lucy highlights the importance of absolute values where health is an issue. She also raises serious doubts about the effectiveness of tap-water sampling practices. The next article, by Robert Grant, provides a timely overview of the history and potential of graphical representations. Robert shows that graphics can provide a fruitful way to make and disseminate radical arguments where these depend on statistical data. Perhaps most helpfully, he provides a wealth of practical suggestions, which will be invaluable for anyone toying with the prospect of learning more about data visualisation. In the last article, Jonathan Bradshaw has written up his Radical Statistics conference presentation from February 2012. In this he uses York as a means for thinking about inequality and poverty and the ways in which these are measured. The issue concludes with David Elliman’s enthusiastic review of The Geek Manifesto, Larry Brownstein’s comment on an issue raised in this book (and the review) – assessing tests of scientific competence, and finally Russell Ecob’s brief summary of the Radstats conference discussion on whether a fair voting system is possible, and what it would look like. We hope that you enjoy, or at least are stimulated by, the articles in this issue. If you think that you have something to say that would be of interest to Radical Statistics readers, get in touch. We are always keen to receive articles, news stories or book reviews. If you are unsure about whether something is suitable, drop us an email and check. Osborne’s latest budget was both a non-event yet contained some peculiar features. In discussing it I have avoided technicalities, particularly mathematical (= algebraic) ones. It isn’t that the algebra is difficult but there can be a lot of it and, therefore, difficult to keep track of. One reason that this budget was such a non-event is that most of the measures that come into effect have already been passed, like the bedroom tax, so called. Another was Osborne’s concern to avoid any ridiculous mistakes. One of the problems besetting discussion of economic policy and budgets is that so many journalists, even those who have some economic training, make fundamental errors. Two who usually, though not always, avoid doing this are William Keegan of the Observer and Larry Elliott of the Guardian. Keegan has written more than once that, in his opinion, Osborne is the worst chancellor in living memory, and he remembers Macmillan’s one year stint as chancellor. Another astute economic commentator is Aditya Chakrabortty of the Guardian. One journalist for whom I have a great deal of respect is Andrew Rawnsley of the Observer. When discussing political matters, he is quite insightful, but when discussing economics, he invariably gets it wrong, as he did this weekend. So, it is important to be able to distinguish the empirically relevant comments dealing with economic issues from those that miss the mark, for whatever reason. There are journalists whom I have not named but whose work is eminently worth reading. What we are experiencing is a private sector crisis portrayed as a public sector crisis. First, let me note that although Osborne and Cameron still try to blame the Labour Party for the ‘disastrous’ legacy they left the coalition to contend with, this discourse has been somewhat replaced with claims that it is Europe’s plight that is hampering the UK’s recovery, a claim he made in this budget. Labour Party spending had nothing to do with the creation of the crisis. Their lack of sufficient oversight of the investment banking sector was, however, a contributing factor. It is highly unlikely that the present government, had it been in office at that time, would have done any better, given its actions so far. Second, he did something quite odd with respect to the Bank of England. Although it was unclear what was meant, since he never spelled it out, some of his and the Treasury’s responsibilities appear to have been shifted to the Bank of England. There are matters that need to be clarified in order to interpret the budget and its fallout. First, there is the nature of money. Second, there is the relationship between taxation and government spending. Third, is the character and function of welfare spending. Since all budgets are political in character, indeed, are ideological in nature, they inevitably affect someone adversely. The real question to ask is, as Cicero did, Cui bono, Who benefits, which he attributed to the Roman consul, Lucius Cassius. In virtually all of Osborne’s budgets, the relatively well-off benefit and the poor do not, even with measures claimed to do so. The second thing to say is that the UK is not Europe and it isn’t Greece, in fact, it is nothing like Greece economically. Because the UK is not a member of the Eurozone, any economic similarities are purely fortuitous. The countries of the Eurozone function more like US states or Australian territories than sovereign nations like the UK. This difference makes a big difference in the range of economic policies a sovereign state has to hand, something not available to the individual European nations. Individual US states and Australian can, and indeed sometimes do, go bankrupt. Sovereign states, on the other hand, due to the kind of monetary system they have, cannot economically go bankrupt. Sovereign can always, in principle, pay the country’s debts. The only exception is if the political system intervenes, as Congress has done in the past in the US. Contrary to an article of the Constitution which stipulates that the government can always pay its debts, Congress can ensure that the government is unable to pay its debts. But this is not because the government has run out of money. A third thing to notice is that credit rating agencies’ ratings have no relevance whatsoever to sovereign nations. A credit rating is an index of how likely the organization being rated is likely to go bankrupt. As the UK can never go bankrupt, these ratings are economically irrelevant. However, they can be politically relevant. Which they are in Osborne’s case as he made them a rod for his own back. A fourth thing to notice is that the economic problems facing the country have nothing to do with the public sector, except incidentally. The fiscal crisis is the consequence of a private sector bubble, not overspending by the public sector. A fifth thing to notice is that when politicians and journalists contend that some measure is being funded by the taxpayer, this is false. While the measure is being funded by the government, it does not follow from this alone that it is the taxpayers who are picking up the tab. The issue is where the money is coming from. This point and the second point are linked. Where does the money the government spends come from? It arises ex nihilo. From nothing. Government creates the money it needs out of thin air. This is the essential difference between what is known as a metal money system and a chartal money system. Many economists and most journalists think in terms of metal money systems. They think something must back up government spending. They are right, but it isn’t anything physical, like gold. It is something intangible, like confidence that the government won’t collapse, or the like. The monetary system that virtually all nations use now is known as a fiat money system with flexible exchange rates vis-á-vis other sovereign countries. This is a money system where the money is self-created. There are hybrid systems, such as the one running between the end of WW2 and the early ‘70s, where you had a fiat money system being treated as a metal money system with gold as the backing. However, since Nixon’s famous statement that we are all Keynesians now, the global currency system has been a fiat money system with flexible exchange rates. The Eurozone could operate a fiat money system like that of the UK or the US or Australia or Japan, but its organization prevents it from doing so. The Eurozone demands a federal economic system with a federal treasury and a federal bank with the requisite powers. While the Eurozone has a central bank, it does not function as a lender of last resort. It can only exercise this function under the table, which renders it ineffective. It has no federal treasury. Creating these institutions would mean a small loss of sovereignty, but this is small beer compared to the loss of economic sovereignty they lost when they joined the Eurozone. So, when Osborne or Cameron say that the government or the treasury has no money, this can only mean that it hasn’t been created yet. What does having a fiat money system mean for public spending on for instance the NHS, or schools, or indeed welfare? It means that the UK can meet all its internal financial obligations without any difficulty whatsoever. (I am ignoring the spectre of inflation for the moment.) So, whenever a government minister contends that the government can’t pay for something like schools or the NHS, they either do not know what they are talking about or they are lying. The issue isn’t whether the government can pay for our schools or the NHS, it is whether this is the best way of running these organizations. This is a problem concerning which institutions should be public and which private (or a hybrid). And this includes banks. My position is that it would not be a bad idea to have government banks where all citizens deposit their money and companies get their loans and leave casino banking to private banks. But this is a separate issue. If the government can create its own funding out of thin air, what is the need for taxes? In a fiat money system, taxes are not needed to fund government expenditure. Taxes do three related things. (a) They legitimate the established currency – taxes can only be paid in the legitimate currency, which is what the government says it is, hence the current furor over the bitcoin. (b) Taxes also direct or constrain private spending. This can, of course, be overdone, and there is an argument for cutting taxation during a deflationary period like the one we are in now. An obvious example is VAT, a crude sales tax. (c) From our current perspective, perhaps the most important function of taxes lies in its redistributive function, thus enhancing surplus recycling, necessary for capitalism to function at all. Put starkly, taxes take the excess from the rich and redistribute it to the poor — this function is related to the second point but is not identical to it. The current coalition is misusing the latter two functions of a fairly functioning tax system, either possibly for perverse reasons of their own or through sheer ignorance about how the modern currency system works. So, when Osborne gives himself credit for spending on this or that, he is doing nothing special. The monetary system within which he works can’t prevent him from doing this. It is not whether he spends that is the issue, it is what he spends his budget on. What is even more important is where he restricts his spending. As we have seen, there is nothing to prevent Osborne spending his budget on anything he likes, as much as he likes. He can spend as much as he likes because in a deflationary economy, there is no likelihood of inflation, that is, there is no likelihood of inflation as a consequence of any spending he engages in. Overspending on his part would only become a problem were there full employment. The inflation we have is due to external factors, like the weather causing food prices to rise, and the like. It is not due to any internally generated wage-price spirals, which can cause inflation to get out of control. When such positive feedback processes take place, the need is to control all the elements of the process, not just one, as was done in the US. Nixon froze both of them. Freezing prices irritates capitalists while freezing wages irritates labourers. Hence, the need to deal with both of them simultaneously in order to be fair to all parties. Osborne has noticed that banks aren’t lending. This is for a number of reasons. One is that the money that the government has put into what are basically insolvent institutions has been used to pay down their debts and to pay back the government. Whatever is left over has been sitting in the banks. It is known that corporations are sitting on funds instead of spending them. Neither individuals nor businesses are asking banks for loans. Banks are not lending because no one is borrowing. Those who can don’t wish to. And those who haven’t been able to still can’t. Why hasn’t QE, quantitative easing, worked? QE is a sort of fiscal policy where the money goes to the banks who are then supposed to lend it out, the assumption being that there are borrowers to lend to. The problem is that the banks have been using the money to pay down their debts, pay back the government, increase their capital reserves, and pay bonuses to their high level employees. It is for reasons such as these that QE hasn’t led to growth. A better fiscal policy would be for the government to directly give the money to businesses or individuals who would then spend it. Tax cuts for the rich won’t lead to spending, while substantial tax cuts for the poor would. Because of the crisis, the surplus recycling mechanism has stalled. Benefits for the rich tend not to be recycled, while those for the poor do. Osborne has consistently failed to place money where it would be used as opposed to saved, or if he places it with the poor via one measure, he removes it with another. The result is that the economic position of the poorer either remains the same or worsens as a more or less direct consequence of his policies. Since Osborne has consistently hammered the welfare system, this surely must be because it is a drag on the economic system. Well, it would be, were we operating in a metal currency system where there is a finite amount of money. Since we are operating a fiat monetary system, there is in principle an infinite amount of money available to the government. In fact, the welfare system ensures a certain degree of circulation and recycling. A better welfare system would naturally ensure greater degrees of the circulation and recycling of money to the benefit of everyone. From this point of view, there is no economic justification whatever for cutting welfare payments. All justification thus tends to be moral in character. Andrew Mellon, Secretary of the Treasury under Hoover, insisted that the rot had to be purged out of the system. This purging applied only to those who weren’t rich or if rich had misspent their money. It can then be legitimately asked: who are Mellon, or Osborne for that matter, to make moral judgments about the rest of us? An identical argument can be made for the pension system. The public pension system is not in trouble. It will never default, unless made to. Hence, there are no economic reasons for Osborne to do what this budget and previous budgets have done to the public pension system. It is clear that economics as a field of study is not just about money and its distribution and recycling in the absence of the social and cultural, indeed ethical, context in which economic activities take place. Osborne makes it clear that he understand this in relation to overseas aid, even though it is only 0.7% of GDP, which given the scale of the UK economy is trivial. However, it is when he deals with the domestic situation that the ethical imperatives become cloudy. It is an odd situation where the poor have to be “beaten” in order to work whereas the rich have to be “bribed”. Investment bankers appear to need to be bribed with bonuses in order to carry out their jobs. Their salaries are obviously insufficient motivation. One of the most important matters in the last budget is the child care provision that is designed to enable those who care for their children to go back to work by enabling them to take advantage of child care facilities which would otherwise be too expensive for them. It is of interest, and perhaps indignation, who benefits from this particular piece of legislation. 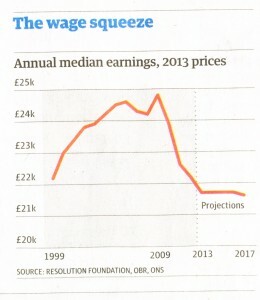 Here is a chart I scanned from the Observer of 24 March. 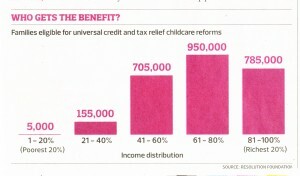 It seems obvious that those whose need is greatest benefit least if at all from this scheme. In fact, the beneficiaries are those who pay a certain amount of tax in addition to those families where both parents work. This distribution of funds makes no economic sense. This entire budget is like this. In this budget and the last, the richer benefit the most and the poorest the least, but in general, everyone loses. If this isn’t a budget based almost entirely on moral premises as opposed to economic ones, then I don’t know what is. Take the LibDems’ £10,000 tax credit or personal allowance. Who benefits? Again from the 24 March Observer [below]. The Treasury contends that even after all allowances are taken into account, the overall impact of the tax and benefit changes will be negative, as can be seen in the chart. In fact, according to the Treasury, the richest 10% are a little over 2% worse off while the poorest 10% are a little under 2% worse off. This difference will not make much difference to the top 10% whereas it will make a great deal of difference to the bottom 10%. In the Treasury’s view, virtually all households are worse off. The economic rationale underwriting this set of figures is deeply flawed. And it increases the economic inequality that we are experiencing now. The perspective I outlined above would turn this on its head. Such inequalities lead to de-legitimization of the social contract. In the US, some of the rich already live in gated communities and have for the past 30 years. And they feel the need to carry guns. Part of this lies in the US’s history, but part lies also in the grotesque economic inequalities that have become so pervasive in the US. Neither the US nor the UK governments, however, have done much to shift the economic burden on their citizens, especially since the financial crash of 2008. If anything, this budget entrenched them further, while claiming the opposite is taking place. In assessing this budget, we must never forget that the financial crisis arose from excessive leveraging in the private sector, most particularly the investment banking sector, not overspending in the public sector. What we are experiencing is a private sector crisis portrayed as a public sector crisis. There is a public sector problem, but this derives from the public sector bailing out the private sector responsible for the crash of the economic system, which occurred because of the absence of sufficient safeguards, safeguards that were in place from the thirties until the ‘80s and ‘90s when they were dismantled. This budget does nothing to deal with the essential insolvency of the banks and their egregious practices. Especially since two of the largest have been effectively nationalized. It is often said that the taxpayer owns these banks. This is true only in so far as the taxpayers/citizens own their own government. Even were we to agree that citizens own their government, it doesn’t follow that the taxpayer is paying the salaries of the bankers. While the government is paying the salaries of the bankers, with our implied consent, the taxpayer is not effectively involved. This is because what government spends is not dependent on its tax base – taxes are not the foundation of government expenditure, as I mentioned above. It has been said by some that this budget may have been a preparation by Osborne to be replaced in the summer Cabinet reshuffle. The 2010 intake and senior Tories want Redwood or Hague to be Chancellor. Because Osborne’s budgets have had so little relation to reality and, therefore, have either had no effect or had a quite pernicious effect, his position has become increasingly vulnerable, leading to a number of his own party wanting him removed as Chancellor. The analysis of he and his colleagues is in my view devastating for Osborne’s policies.